I Am Not A Witch film. The award-winning Zambian film "I Am Not a Witch" will be the country's first film to debut on Netflix. It joins other African films, such as "The Boy Who Harnessed the Wind" on the international streaming service. 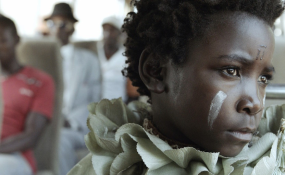 I Am Not a Witch, a Zambian film about an eight-year-old girl, played by Maggie Mulubwa, earned the Outstanding Debut award at the 2018 BAFTA's and will now debut on Netflix. The film is based on the experiences of many women across the African continent. Zambian-born filmmaker Rungano Nyoni spent time at a "witch camp" in Ghana for source material, reports BBC Africa. The film's synopsis states: "Following a banal incident in her local village, eight-year old Shula is accused of witchcraft. After a short trial, she is found guilty, taken into state custody and exiled to a witch camp. At the camp she takes part in an initiation ceremony where she is shown the rules surrounding her new life as a witch. Like the other residents, Shula is tied to a ribbon attached to a coil that perches on a large truck. She is told that should she ever cut the ribbon, she'd be cursed and transformed into a goat." A review at the Sundance Film Festival described the film as "gorgeously photographed and performed with resolute confidence, Nyoni's astounding work layers satire and social critique into a richly textured and refreshing take on institutional subjugation, and the film resonates with earth-shattering power." The Guardian newspaper stated, "Zambian-born Welsh director Rungano Nyoni has delivered a pulsingly odd and strikingly original debut: a tale of dogma, prejudice and corruption in the country of her birth. It's a strange witches brew of deadpan farce and arthouse stillness that some will find exasperating, and it's not without its missteps; but there's a confidence and clarity of vision that's hard not to admire, especially for a first feature." Just like The Boy Who Harnessed the Wind, the film was shot in a country with little infrastructure to support the project but the filmmakers decided to stay true to the story and its setting regardless of these challenges. Nyoni's aesthetic as a self-taught cineaste began when she was first introduced to the concept of arthouse filmmaking by Michael Haneke in his film The Piano Teacher. For her feature debut, Nyoni envisioned a Wales-based project, given that she grew up there. Instead she found herself in Zambia, making a low-budget film that "ticks all the wrong boxes for first-time filmmakers, working with multiple nationalities, animals, amateurs and children in a country with little in the way of infrastructure," reported the entertainment news site Deadline Hollywood. This Zambian fairytale is unique, beguiling and just strange enough to be magical. The entire process took four years, but Nyoni's efforts bore fruit with the film first garnering awards and now debuting on a platform that has a viewership in the millions.